One of my main problems with most sitcoms is that I usually don’t like the humour. So much of it is based on shaming or embarrassing people and jokes that make fun of (marginalised) people? Not cool. ODAAT is amazingly funny and full of humour but the laughs are never mean. It’s goofy, it’s dramatic, it sometimes is self-deprecating but most of all it’s so very relatable and it just makes you laugh. There is a lot to laugh about in ODAAT but there is also so much that hits you right in your feels. The show handles most of the topics it tackles in a fun, positive and supportive but also very real way. There are some hard truths in there, some tough things for characters and viewers to get through and more than one very emotional moment. So be prepared, because there will be tears, both happy and sad, and probably also quite a few from laughing so hard. Each episode of ODAAT is centred around and brings awareness to an important and timely real world issue. Be it sexism, mental health, depression, anxiety, consent, harassment, toxic masculinity, mansplaining, religion, alcoholism, addiction, racism, immigration, lgbtq+ rights, coming out, … the list goes on and on. All of the topics the show tackles are sensitive ones, ones that are important to a lot to people, ones that are oh so very important in our world today. And the show handles them so very well. It never felt preachy to me but also never shied away from addressing social justice issues realistically and thoroughly and always managed to get its point across. ODAAT shows how these issues are widespread problems and yet highly personal in the way people experience them, how they affect people’s lives and how people (try to) deal with them. There is so much to love about everyone on this show. Single working mom Penelope (Justina Machado), her very Cuban mother Lydia (Rita Moreno), her nerdy feminist daughter Elena (Isabella Gomez), her son Alex (Marcel Ruiz), who really gets to shine in the third season, token white guy and landlord Schneider (Todd Grinnell) and Dr. Leslie Berkowitz (Stephen Tobolowsky), Penelope’s boss and Lydia’s love interest are all awesome in their own ways and there’s also a whole host of amazing secondary characters. I personally adore Syd (Sheridan Pierce), Elena’s ‚Syd’nificant other – they are nerdy and cute and their relationship with Elena is part of so many fun episodes. 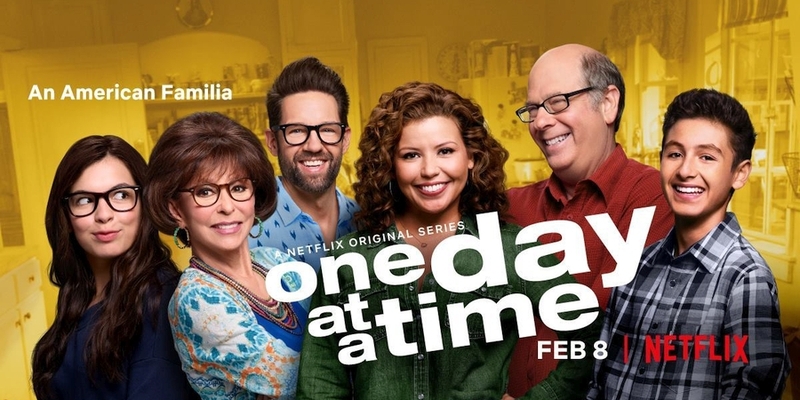 Yeah, okay, that one is … Aaanyway, there’s three seasons of „One Day at a Time“, each season has 13 episodes that are all about 30 minutes. So a total of 19,5 hours. And yes, that is totally doable in a day. But I would not exactly recommend it. For one thing spending that much time in front of a screen just isn’t all that great, but mostly the show is just too good to have it running in the background without really paying attention to it. It is however a highly rewatchable show, so even though there are only three seasons as of now, you’re in for a lot of entertaining (and educating) viewing time. It’s characters like Syd and Elena, nerdy queer teenagers, that I would have loved to see on TV when I was a teen myself. There is so much positivity and support in the way marginalised groups are portrayed in this show: Yes, life can be hard and horrible and hurtful, but there are other people like you out there, and needing help and seeking support is perfectly alright. For me some of the episodes about mental health, stigmata, therapy and medication, anxiety and depression especially were really hard to watch, because I can relate to so many aspects. And at the same time seeing them is so good, because seeing these things being shown as they are, with all their ups and downs but always without judgement and with a lot of hope is important as hell. And, as I said before, multiple times, there are so many though topics in there that often don’t get the representation they deserve and that a lot of people will be able to identify with in some way or other. And the ones that don’t affect you personally? You still get to see some really good representation and maybe learn a thing or two or three about them – I certainly did. Toller Beitrag, unterschreibe ich so. Ich liebe diese Serie so sehr und finde es klasse, wie jedes mal wichtige Themen angesprochen und diskutiert werden, ohne dass man sich als Zuschauer dabei belehrt fühlt. Es wird einfach gezeigt, welche Rolle sowas im Alltag spielt und wie man konkret von Problemen wie anxiety oder Sexismus betroffen sein kann, da sich das einige ja scheinbar immer noch nicht vorstellen können. Ich habe die dritte Staffel innerhalb von zwei Tagen geschaut und danach direkt noch mal mit der ersten angefangen und mittlerweile stecke ich auch schon wieder tief in der zweiten. Das wird nicht das letzte mal sein, dass ich sie schaue und auch ganz sicher nicht das letzte mal, dass ich sie überall empfehlen werde.